Mankind's primordial dream of flight is taking off with a new twist as a Slovak prototype of a flying car spreads its wings. Inspired by the books about flying by French authors Jules Verne and Antoine de Saint Exupery, Slovak designer and engineer Stefan Klein has been honing his flying machine since the early 1990s. "I got the idea to start working on a vehicle of the future at university, but honestly, who hasn't dreamt of flying while being stuck in the traffic?" Klein told AFP. 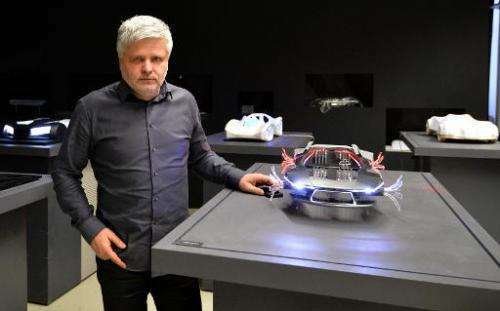 "Flying's in my blood—my grandfather and my father flew ultra-light aircraft and I got my pilot's license before I was old enough to drive a car," said Klein, who has designed cars for BMW, Volkswagen and Audi and now teaches at the Bratislava-based Academy of Fine Arts and Design. His elegant blue-and-white vehicle for two is six metres (20 feet) long so it fits neatly in a parking space or a garage and tanks up at any filling station. But once it reaches an airport it can unfold its wings within seconds becoming a plane. Dubbed "the world's prettiest and best-designed airborne automobile so far" by US aviation magazine Flying and Inhabitat.com design, an innovation website, the Aeromobil also has the distinction of originating in Slovakia, the world's largest per-capita car producer. 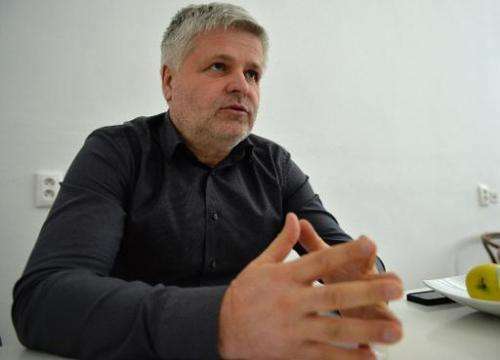 "So far there have been about twenty attempts to manufacture a flying car around the globe," the president of the Slovak Ultra Light Aviation Federation, Milan Ciba, told AFP. "Among them, Aeromobil appears very viable," he said. Other models include the US-based Terrafugia's "Transition" flying car expected to be launched on the market within a year, while the helicopter-type Dutch PAL-V gyrocopter could go on sale in this year. Klein's dream took to the skies in September when he piloted the Aeromobil during its first wobbly test flight. Once airborne, the it can reach a top speed of 200km/h (124 mph) and travel as far as 700 km (430 miles), consuming 15 litres (4 gallons) of petrol per hour. "A combination of a car and a plane will always lose against the competition when we start comparing energy consumption," Jan Lesinsky from the Slovak University of Technology told AFP. But would-be users could glide by long lines and security checks at airports, saving time on medium-distance journeys. Klein and his team are currently working on the next generation of Aeromobil that will go into production in a few months and hopefully receive Slovak Ultra Light Aircraft Certification (SFUL). "Would-be users would have to follow the legislation already in place for ultra light aircraft," SFUL president Federation Milan Ciba told AFP. "Pilot/drivers will need to have both a driver's and pilot's licence with at least 25 flying hours," he added. An enthusiastic pilot himself, Klein remains down to earth when looking to the future. "I don't expect Aeromobil to go into mass production, it will always be an alternative means of transport," Klein said. "It can, however, be very interesting for countries with vast areas lacking infrastructure like Russia, China or Australia," he added. Flying cars will most likely take off among pilots licensed for ultra-light aircraft, says Ciba. "It would make their lives so much easier—they would be able to park their car/aircraft at home, drive to the airport, take off, land and drive to their destination without switching vehicles," he muses. This project is nearing flight tests and I believe it is the real contender for a "flying car". Slovakia, the biggest car producer you never heard of. And to think in the Soviet time it was a backwater. Now produces a flying car.. A picture of it would have been appreciated. That rose petalmobile is not it. NO! A picture of it was expected. In this digital era - who writes and article about something few people have seen - without showing a picture of it. Interesting.I like the ducted fan layout.Those wings look tiny.It would take a pretty long runway to get up to takeoff speed. Whydening Gyre, yes looked at that but doesn't the tail prop cause a problem for ground regulations? I know it wouldn't be in operation in ground traffic but nonetheless I'm pretty sure places like the UK would regard it as a problem. Their FAQs speak of a CVT,so I have to assume the Switchblade engine drives the wheels on the ground,and power is diverted to the prop for flying. What sort of pilot's license? What's the risk? Just based on what we experience with automobile drivers, if the prospect is for large numbers of these vehicles to be in the sky, considerable effort should be invested in minimizing the effects of operator error. Something that does its own navigation, and automatically avoids other vehicles would be nice. I'm sure terrorists already are looking at this as a desirable vehicle. Huh. Those flight clips look like an RC model. The Switchblade engine drives a transmission that has an shift lever to run the ducted fan vice the wheels. I have been following this development for several years. This vehicle has some similarities to the PAL-V in shape. The wing loading is higher than on my Piper 28-140, and is similar to an aerobatic type plane. An interesting thing is that the take off is accomplished by driving the wheels to take-off speed and switching to ducted fan at that point. (Any failure up to this point is handled as a car) Landing speed is about the same as a Piper. Cost will be about 1/2 to 1/4 the cost of the Aeromobil, PAL-V, or Terrafugia's "Transition" flying car. The plan is to sell it as a kit, with an "assisted factory build" option. The FAA says that as a kit, the builder must "fabricate" over 1/2 of the aircraft, so I wonder how this will work. The Switchblade engine drives a transmission that has an shift lever to run the ducted fan vice the wheels. Not clear on what you mean.So the transmission switches between the prop and wheels,depending if the vehicle is flying or on the ground? As I understand the Switchblade design, "...the transmission switches between the prop and wheels,depending if the vehicle is flying or on the ground..."
Hey, Nungman... Terrorists can already "pilot" ordinary cars and trucks into buildings. They could load a semi truck full of more explosives than this thing could pack, for much cheaper than getting one of these to do far less damage. Do you really live your life in that kind of paranoid fear, looking for ways terrorists can make use of any new technology?